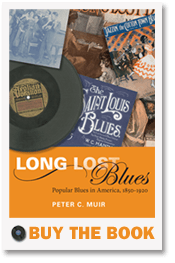 Peter Muir is an acknowledged authority on American vernacular music with a Ph.D. in musicology. A former lecturer at City University of New York, and head of keyboards at Westminster School, London, he has produced scholarly articles for numerous publications and encyclopedias, including the Routledge Encyclopedia of the Blues and the Oxford National African American Biography. A versatile international pianist, lecturer and recording artist whose playing has been described by the New York Times as “potent” and by Newsday as “terrific.” Since graduating from the Royal College of Music, London, where he studied piano with the late Yonty Solomon and was the winner of several prizes and fellowships, he has performed on four continents to wide acclaim. As a soloist, recent appearances in America include the Scott Joplin Ragtime Festival, the Tom Turpin Festival, the Alexandra Bay Jazz Festival, the Indianapolis Ragtime Society, and the W. C. Handy Festival at City University of New York, along with concerts and broadcasts in Britain, continental Europe, Hong Kong, and Australia. Recent concerto credits include a widely acclaimed performances of Gershwin’s Rhapsody in Blue and Liszt’s Totentanz with the Newburgh Symphony Orchestra. Dr. Muir has worked extensively as an accompanist, including with the British tenor Ian Bostridge for appearances in the United States and the soprano Susan Burghardt. In addition to all this, he has worked as a choral and orchestral director and has a unique talent for creating improvised music tracks for silent movies, which he most recently did for the Australian National Sound and Screen Archive in Canberra, Australia. In addition, he has composed extensively. His compositions have been broadcast in Europe and America and major commissions include dance works for Ballet Rambert and the Royal Ballet, and incidental music for Middleton’s Women Beware Women at the Royal Court Theater. Most recently he arranged and performed the music for the documentary The Chifleys of Busby Street (Ronin Films, 2007), the independent movie Wishing Well (2009), and the play Fables in Slang for the off-Broadway Melting Pot Theater Company. Dr. Muir’s philosophy is guided by a belief in the fundamental beneficial power of music. He has worked closely for fifteen years with John Diamond M.D., the foremost authority on using music as a health modality. He is director of the Institute for Music and Health in Verbank, NY, a nationally recognized center pioneering the use of music for well-being (www.musichealth.net).